Which powerful influence are you failing to use? I think we would all agree: Talking is not necessarily communicating. Real communication is not a one-sided affair. The real goal of effective communication, whether it is in our schools or with our spouse, children, or co-workers, is to share information or ideas with the desired result that the recipient understands our meaning and sees our point of view. I didn’t say they agree with our point of view, but they at least see it. The most effective communication is usually about “we instead of me.” Let’s not do our schools or professions the disservice of merely talking and then feeling like we’ve done the work. As in any relationship we value, let’s put in the effort to do it right. As a former public relations director, I always had a hard time describing where public relations ended and the other communications areas began. Because most American schools can’t afford to have specialists in each of the areas that fall under the communications umbrella, some of the overlapping areas are often neglected, and our communication effectiveness can become counterproductive. For example, can you think of a company that has strong marketing efforts, but their customer service fails? Or maybe a company where social media is edgy and fun, but their public relations is always in crisis mode? For me, an example is McDonalds. Their marketing was compelling, but my personal experience with their customer service belied their marketing promise. The exact opposite happened for me with Chick-fil-A. I wasn’t familiar with their marketing messages or their brand, but my initial customer service experience with them simply blew me away. It was only after positive experience (consistently, in different locations) that I even noticed their ads. In my experience, they maintain a cohesive and effective communications message with their customer service, marketing, social media, branding, and public relations. This shows in their competitive success. How can you get your school to do the same? 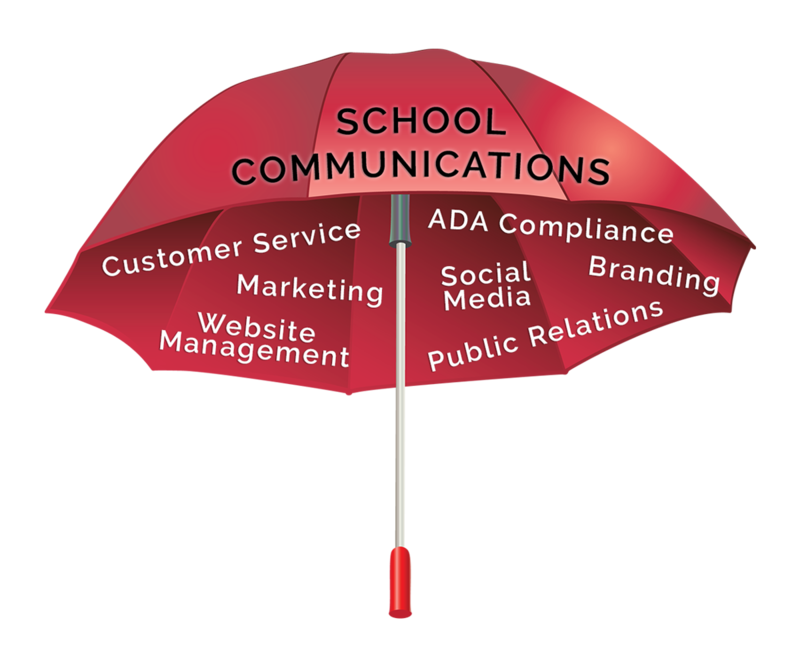 What’s under the school communications umbrella? When you consider your school’s communications strategies, go for consistency (everything you do should support your school’s mission) and use a multi-prong approach. Here are some of the areas that contribute to truly effective school communication strategy. Include them all! Early in my career, I was a school secretary. As I look back on that job experience, I recognize that I failed at one of the most important aspects of the job. Why? I didn’t know it was expected. It wasn’t part of my training. It evidently wasn’t very important. Or was it? In retrospect, I realize it was one of the most important services I could have provided to my customers (and yes, parents, students, and school staff were my customers). One aspect of my job was to provide great customer service. Based on my experience working with schools in the decades since (and yes, I’m that old), this expectation in many schools hasn’t changed much. It needs to. In a big way. Every single school employee should receive customer service training—or at least understand its value to their customers and to their jobs. Each of us connected with a school, whether we are staff, volunteers, or administrators, are representatives of that school. We represent what it stands for through our words and actions. We are there to serve. If we don’t, we will create gaps and challenges to effective communication. Does your school have the reputation of the Department of Motor Vehicles or the Ritz-Carlton? Your answer will depend on what you expect of your staff. Do your teachers make sure they have a positive contact with parents before contacting them about a problem with a student? Do you have a cranky receptionist in the front office? Do your office phones go unanswered (or are callers consistently forced into an automated phone system—which isn’t answered)? I’m guessing, unless you have customer service training in place, there is room for improvement. Yes, we know that in your heart, you are a caring, dedicated professional. You are proud of the work you do and the difference you make in the lives of others. But, as educators, we often make assumptions that are not based in reality. Our customers form their opinions based on our actions, not on our admirable intentions. Our customers are the reasons we have careers. They want to feel welcomed, valued, and understood. They need our assistance while maintaining their dignity. What do schools do wrong? Sometimes we don’t hire for the right qualities (warmth, empathy, optimism), and other times we don’t train correctly. We should include customer service training for every school employee and volunteer as part of any onboarding or new hire process. If we don’t set expectations, we are not likely to see success. These expectations usually come from the leadership in the form of written expectations, examples set, and recognitions made. Great customer service in schools improves communications at every level. It builds trust, creates positive relationships, reduces problems and misunderstandings, increases enrollment, and reduces staff turnover. If you don’t do anything else to enhance your communications strategies, put your efforts into creating a remarkable school customer service environment. Get started with our complimentary eBook: How to Create Sensational School Customer Service. #1 - Keep it current. This is critical. If the latest information isn’t on your school website when your customers go there, you are sending the message that it isn’t a reliable communication resource. They may not come back. #2 - Match skill sets and training to the job. Your school website is not a technology project. It is a communications project. It is the most visible and frequented information resource your school maintains. If not done well, it can do more harm than good for your public relations, branding, and reputation. It shows the public what you believe in, or possibly what you don’t. It requires skills like those focused on in this article: public relations, marketing, and all aspects of communications. Who is managing your school websites? #3 - School-level websites matter. Many public school websites include a district website and individual school sites for the various buildings and grade levels. This is very smart. Once a parent enrolls a student, they seldom visit the district or main office website. They instead go directly to the source that contains the information specific to their child’s activities. They don’t want to wade through the business end of your school district website each time. They want the information that impacts their child. So, make sure it is worth the visit. Grade level sites, the district MVPs. #4 - Incorporate website best practices. From the tone and word choice to navigation and content, maintain best practices. That includes knowing what taboos to avoid as well. #5 - Create and maintain an exceptional school website. This useful eBook will get you started! There is an old adage that says, “If you want to catch fish, fish where the fish are.” Well, today, the fish are on social media. If you don’t engage there, you are missing the interchange with a majority of your customers. Used in conjunction with your school website, you have powerful tools at your disposal. Interest and engage them on their social media, and send them to your website for “the rest of the story.” It is an ideal and very effective push/pull communications strategy. School Social Media Management, Part 1 & Part 2. What is it? As described by the Public Relations Society of America, public relations (PR) is “a strategic communication process that builds mutually beneficial relationships between organizations and their publics.” The short version is that it is about building relationships. It is your effort to influence positive attitudes. The goal is to get your audience to know, like, and trust you. It means establishing relationships with the media and your community, and it involves research, planning, implementation, and evaluation. The goal is transparent, honest, and ethical communication. If you don’t manage your school PR, you are at the mercy of others who will. If you don’t tell your own stories, you may not like the stories others tell about you. Check out our Crash Course in School Public Relations to get started. Or, let us hire someone in your community to do this for you part-time, under our tutelage with PR4Schools. Some schools believe if they aren’t losing students to other nearby schools, there is no need for school marketing efforts. Those schools would be wrong. Marketing isn’t only about attracting more students or highly-qualified staff, but in highlighting your successes, telling your stories, and showing the world what is special about your school, your students, and your staff. Special Bonus: For actually sticking with us this far in this article, for a limited time, you can take $100 off the price of our 50 weeks of Marketing Your School toolkit/calendar. It includes strategies, ideas, and templates that will last you for years. You’ll even receive access to the online resources to supplement the marketing calendar. Go to www.MarketingYourSchool.org and use the word “success” in the coupon area for $100 off! As mentioned above, in order to stand out in the minds of your customers and potential customers and to be able to compete in an age of school choice, you need two things. You need to know who you are and build a powerful brand based on that knowledge. Your brand is more than your school colors or your logo or mascot. It is the feeling invoked when people hear your school name. It can generate confidence and trust. It is a powerful tool in your communications arsenal. When used in conjunction with the other tools described here, you will be amazed at the impact you can have on your students’ education as well as their success and confidence in their future. Who could ask for more than that? Why, you ask, would we include ADA compliance under the umbrella of communications? One reason is that this audience is estimated to be as large as 15–20% of the population. You simply can’t and shouldn’t ignore their communications needs (especially since it is also a civil rights law in most countries). You want all your communications efforts to be enjoyed by everyone, right? We could have put website accessibility under customer service, website management, or even public relations, as it applies in all these areas, but we thought it deserved its own discussion. Because we’ve written reams on this subject though, we’ll summarize here. You need to make sure your school websites are accessible to those with disabilities. That means your sites will need to meet WCAG 2.0 AA standards. To find out more about what that means and how to get there, here are some articles that should help. Once you’ve complied with those requirements, be sure to let your customers know that your school is committed to ensuring everyone has the information they need. Provide them with a way to contact your school if they have difficulty accessing anything on your website (usually a form to complete that will help you know what it is they need and possibly a phone number to call). If you get a request, be sure to respond promptly. This way, communication is inclusive. That’s always a good thing. So, there you have it. Seven areas that all fall under the communications umbrella, and each is important. The lines between them blur a bit, which actually makes them easier to implement. But, if you ignore one or two, you do so at your school’s peril. If you need help, you know we’re here for you, so reach out. We have services to help you integrate them all for a best in class communications strategy that will help you and your school stand out from the crowd. Happy communicating!